Funky little Oskar Blues Grill & Brew started just under 18 years ago when Dale Katechis and his high school sweetheart stumbled across the small town of Lyons, Colo., while on a road trip north from their home in Alabama. In 2012, that Rocky Mountain trip continued east as Oskar Blues Brewery expanded to a second home in the rolling hills of Pisgah National Forest of Brevard, N.C. Now, Dale and Oskar Blues are heading south to Austin, Texas, the Live Music Capital of the World, as another place to call home. Oskar Blues will open a brewery and taproom in Austin by April 20, 2016. The brewery will continue its tradition of soul-savin’ live music with a music venue as part of the taproom. “North Carolina and Colorado are filled with amazing communities and experiences mingled with live music and great craft beer scenes. The passion and rebellious nature of Austin locals, along with the food, craft beer and live music scenes create a vibe that already feels like home,” Dale Katechis said. The brewery secured a 50,000-square-foot brewery space including a 5,000-square-foot taproom/music venue location at 10420 Metric Boulevard. 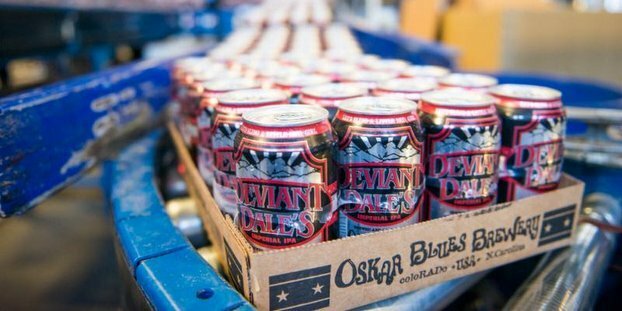 Oskar Blues will brew the full line up of cans and draft with an initial capacity of 30,000 BBLs per year with potential build out capacity exceeding 100,000 BBLs. “We continue to look at options to grow our brewery to the next level and the experience of opening a smaller, intimate taproom and brewery on a grassroots level in Brevard was a hell of a lot of fun. As we grow it’s important to find ways to stay small, engaged and intimate within the communities we want to spend our time in,” Dale said. Oskar Blues is known as the first craft brewery in the country to brew and hand-can its beer, which began in November 2002. Since then, Oskar Blues has continued explosive growth and is regarded as one of the fastest growing breweries in the country. In 2015, Oskar Blues earned a position in the top half of the Inc. 5000 list of fastest-growing private companies in America for the fifth year in a row and is ranked number 24 on the Brewers Association Top 50 Breweries list. As the brewery and Colorado restaurants have been blessed with growth, Oskar Blues also works hard to keep that hands-on, grassroots feel by kicking off small projects like The Crowler, B Stiff & Sons Old Fashioned Root Beer, Hotbox Coffee Roasters, North Carolina’s REEB Ranch and handmade mountain bikes with REEB Cycles. Love Oskar Blues ! We need one here in Oregon! Force 10 Barrell out of the state – no more Anheuser!! !